Early study results show response to therapy in more than 90 percent of patients. 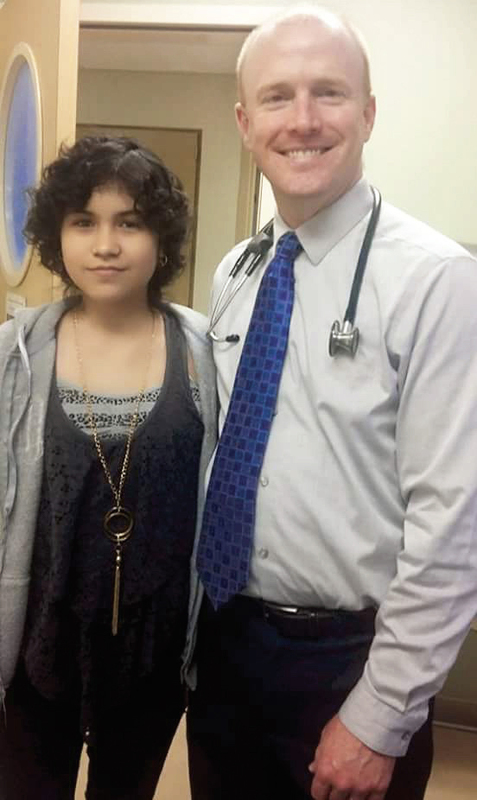 BRIANA AYALA, 13, benefited from a larotrectinib clinical trial led by THEODORE LAETSCH, M.D. A DRUG THAT TARGETS a fused gene frequently found in some rare pediatric cancers has shown great promise in a clinical trial of patients ranging in age from 1 month to 21 years, according to researchers from the University of Texas Southwestern Medical Center in Dallas. The phase 1/2 study, published in The Lancet Oncology, included 24 patients and was conducted from December 2015 to April 2017 at eight U.S. sites. Larotrectinib, a tropomyosin receptor kinase (TRK) inhibitor, was administered to patients twice daily. All patients had been diagnosed with locally advanced or metastatic solid tumors or central nervous system tumors that had relapsed, progressed or were nonresponsive to available therapies, regardless of TRK fusion status. The 17 patients whose tumors harbored TRK fusions had primary diagnoses of cancers such as infantile fibrosarcoma, other soft tissue sarcomas and papillary thyroid cancer. Researchers were able to evaluate 22 patients. Of the 15 who harbored TRK fusions, all but one showed an objective response by investigator review. Four patients saw no signs of cancer (complete responses) and 10 saw their tumors shrink (partial responses). One patient’s initial partial response became stable disease at a later assessment. Independent radiology review confirmed objective responses in 14 (93 percent) patients with two complete and 12 partial responses. The seven patients without TRK fusions had progressive disease as best response. “The TRK fusion is like an engine that’s always turned on, and it’s turned on because two genes are stuck together,” Laetsch said. “One gene is supposed to be turned on as a normal gene in your cell. The TRK gene is supposed to be turned off. But they’re stuck together, so that first gene turns on the TRK gene, so it’s continually active and driving the cells to grow and become cancerous. Within weeks, the girl’s tumor shrunk significantly. Now 13 years old and back in school, Ayala tells CURE® she is feeling much better but was hesitant about returning to her friends. “When I first went back to school, I was glad — and a little nervous because I had changed a lot in my appearance,” she said. Ayala spends her days drawing — she aspires to be a fashion designer in New York City — and walking her miniature poodle, Goofy. She credits her faith with helping her through the tough days and shared that message with a young girl who was crying during a visit to the clinic. “I told her that she needs to act positive so she can fight her disease. I told her, ‘Don’t worry, God is with you. Don’t fear,’” she said. The researchers noted that 21 of the 24 total patients experienced side effects, but only four were grade 3 treatment-related. Larotrectinib has been submitted to the Food and Drug Administration for approval based on the findings of this trial, as well as those of a study published in the New England Journal of Medicine that showed a 75 percent response rate in 55 adult patients.